I find being an older woman to be fascinating in numerous ways. It is a time of taking stock, of stretching new parts of myself and developing new relationships with my own children. 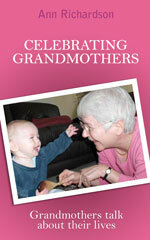 I found the role of grandmother to be captivating – so much so that I decided to write a book about it. I have written books all my life, mostly for social care and health service professionals. But my real love is writing narrative non-fiction for the general public – books derived from interviews that use people’s own voices to express their experiences. These are a form of non-fiction that feel like fiction because they explore people’s inner lives. The latest is about being a grandmother. Based on interviews with 27 women of very different ages, backgrounds and social circumstances, Celebrating Grandmothers tells what it is like to be a grandmother in the words of grandmothers themselves. There are reams to be written about being a grandmother. There are the very happy grandmothers, full of joy at the new children in their lives and the new sense of love and excitement watching them progress. They may be eager to spend time playing on the floor with toddlers, going to the park with children or talking to teenagers about thoughts of concern to them. There are the less happy ones, separated from their grandchildren by sheer distance or difficult family relationships. Some love visiting their children and taking part in their lives – and those of their grandchildren, of course – for a week here or there. Some do not cherish the prospect because the marriage of their son or daughter is unsettled and they do not want to spend time in the middle of quarrels. Being a grandmother means entering into uncharted territory on a number of fronts. There are new relationships to be negotiated, not simply with the grandchildren (generally easy) but also with their parents who have their own long-standing issues. A new daughter- or son-in-law can be an enormous pleasure or the source of great difficulty. When children arrive, all these relationships become much more entangled in both joys and misunderstandings. It can be difficult to tiptoe through the minefield of offering what feels like much needed advice without causing inevitable problems. Being a grandmother can often mean a major change in how a woman spends her time. She may be delighted to babysit as often as possible, but she may also be thrust into a heavy involvement due to the cost of alternative childcare and find it difficult to say no. Separated parents, an ill parent or even a deceased parent can bring even greater responsibilities. There can be a fine line between what a grandmother feels she has to do and what she wants to do. And, finally, being a grandmother means coming to terms with a new status and a new sense of one’s role in life as one of the elder statesmen of the family. It brings an inevitable look into the future and all that that entails. All of which is to say that there is no shortage of things to write about when addressing how it feels to be a grandmother. New people to love and worry about, new relationships to be coped with and a new sense of self add up to major changes in a woman’s life. Yet most of us simply love it. Ask a new grandmother about how her grandchildren are and watch her face light up. It happens over and over again.